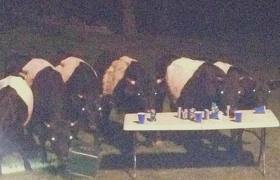 Several stray cows crashed a backyard party in Massachusetts, grabbing a few beers before police started chasing after them. Boxford Police said they heard screams before a group of women took off, running from five or six party crashing bovines. The thirsty cows eagerly helped themselves to the beers left behind.